Looking for a homestead farm design to get more out of your land? You’ll be glad you found me today because I’ve gathered 15 homestead farm design ideas to help you out! Whether you’re starting from scratch or want to improve your current homestead’s setting, having the perfect homestead farm design will help you maximize your land’s fullest potential. 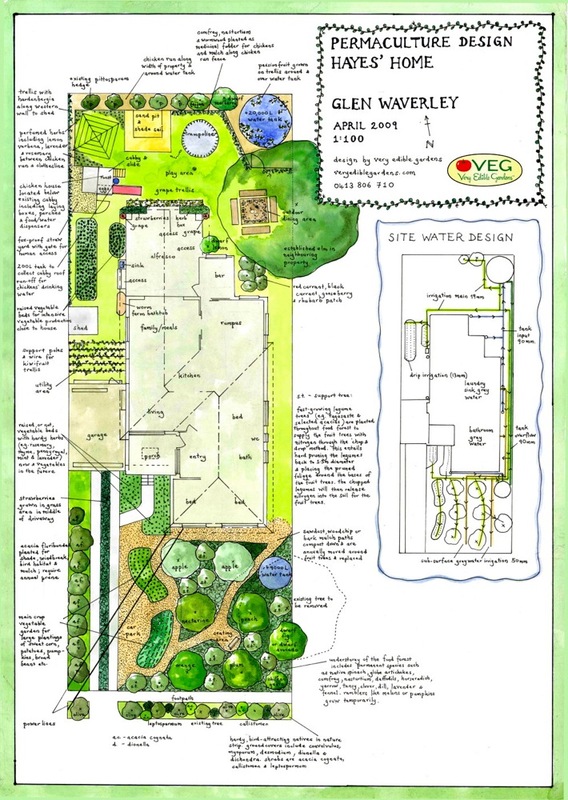 Check out these layouts and stir up some wonderful ideas to help you in your homestead. This basic farm design is intended to give you an idea of what your property is capable of, and how you can get it started. So this layout is a visualization of what a traditional homestead farm generally looks like. However, you may need to have a bigger land area to make this work. But, if you are working with a smaller plot of land, don’t worry, because you can try to duplicate this on a smaller scale. The creator of this complete layout considered all the essentials for a homestead farm. The layout reveals to you what exactly is required for becoming self-sufficient and earning a profit at the same time. In addition, they’ve considered how you could make the most of your home while raising lots of meat and eggs to support your family. I find this design one of the most comprehensive and pleasing to look at. If you have a bigger farm, more than a few acres of land, then you might find this bigger farm layout to be perfect. It integrates all of the common farm buildings. Plus, it has a lot of room to grow your own food and raise your own meat. So if you have the luxury of a bigger farm, consider using it to the fullest of its ability. This homestead design has it all covered, from functionality and style. It has a solar panel, office area, and plenty of areas to grow food whatever the season is. So if you are looking for a well-organized and a functional layout, this could be the design you’re looking for, as you can also easily alter it to fit the size of your land. If you’re daring to be different but don’t want to sacrifice functionality, then this unique homestead design is something you can follow. It has all the necessary things needed for homestead living and a couple of extras, such as the root cellar. 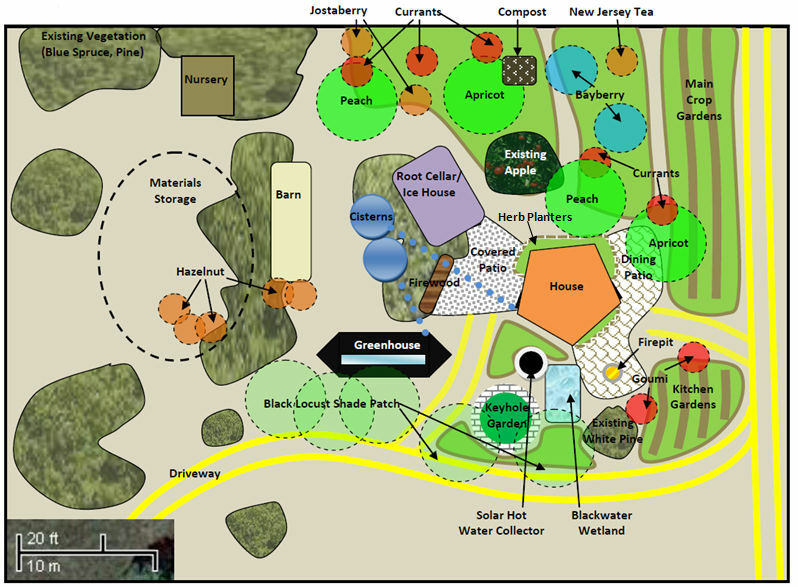 If you are keen on details and well-organized design, your search ends with this permaculture layout. It provides specifics from embellishments to functionality. 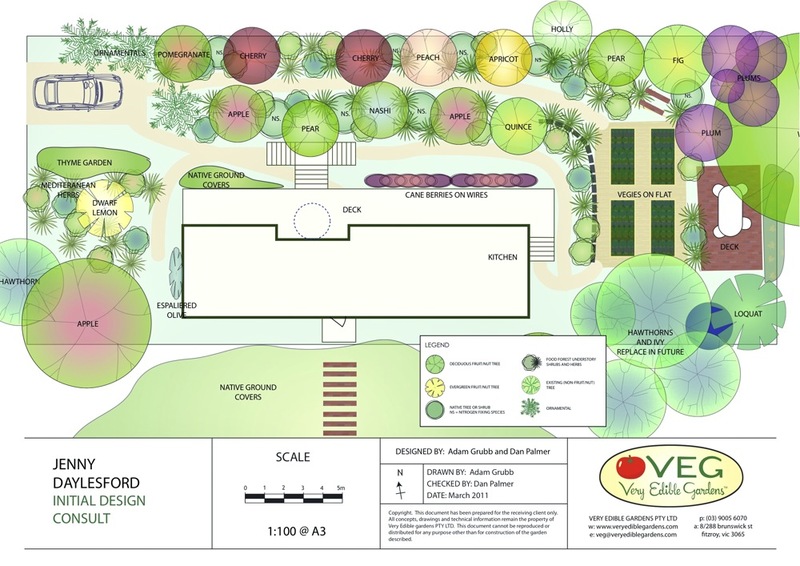 Take a look at the garden of this design, you have a couple of plants for food and a couple fruit trees to sustain, which I found very manageable. If you want your homestead to be not just functional but also beautiful, well, I would say we’re exactly the same. And I don’t see any reason not to have both if we could have it. This designer micro layout consists of both raising livestock and growing your food and also provides specifics to where you can grow your ornamental plants. A must see layout! “There are so many kinds of beauty and I try to relish any form of it whenever I can. But there is none like the living, breathing, ever changing beauty of this earth. Spring is here! Throw open the windows! It’s time for mud and seedlings, it’s time for sunscreen and working in the soil. I can’t imagine a life under flourescent hums, drinking bottled water in my cubicle. I’m grateful for the long road I had to navigate to get here, because now…I’m here.” – @orphans_cookbook | We want to share your #HappyHomesteading stories, so go ahead and use the hashtag for a chance to get featured! If you want to be completely self-sufficient, you’d better check out this all-inclusive design. It has all the necessary details for the arrangement of your garden and nice amenities for day-to-day living. It also has a layout for your homestead water system. This design is a seamless way to help you become self-sufficient. And even better, this design includes a scaled version for smaller land areas. This homestead flock layout is another design meant to be beautiful and functional. If you have trouble growing your plants, a nice raised kitchen bed is featured in this design and I’m totally loving it. If you also want to raise chickens, this design surely fits the bill. It suits a small homestead neatly and efficiently. This way your home is not only beautiful but a bit more self-sufficient. If you are situated in the suburbs and have a piece of land you want to use for self-sufficiency, then, this tiny backyard layout will help you out. It provides information on how to raise chickens and how to grow your own herbs and vegetables in a tiny space. If you don’t know how to make your 1/4 acre land functional, you’d better check out this layout. It provides an idea how to grow your own food, and space to raise goats and chickens. 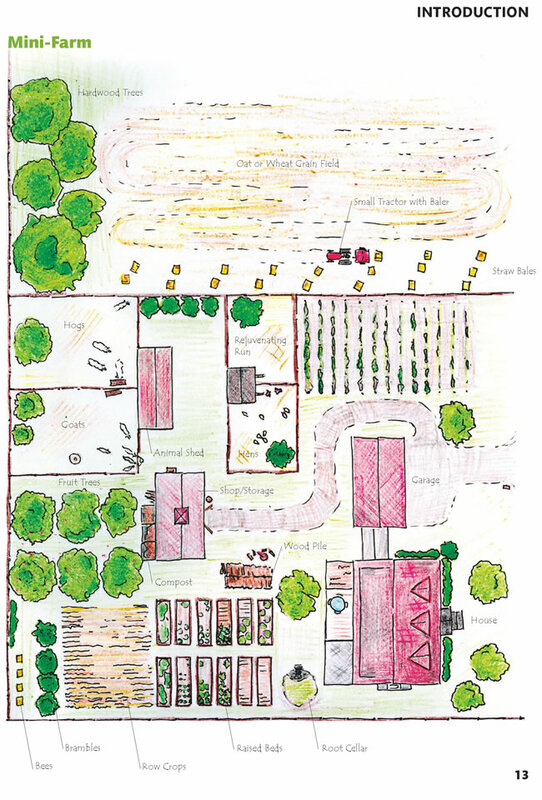 Turn your 1-acre land into a fully functional homestead with this 1-acre layout. This Mother Earth News post will make you appreciate how you could start farming in the small land area. You’ve better check out this layout to fully understand how you can divide your land to become self-sufficient. This design is for urban homesteader. It has lots of ideas that you can put into consideration when creating the layout for your homestead. For example, you need to consider what plants your planning to grow. However, you also consider a place for enjoyment and relaxation in your homestead. I found this 2-acre layout completely detailed when it comes to becoming a self-sustainable homestead in just a 2 acres of land. You can even adapt this if you have more or less space to obtain its full potential. This may not be a full homestead farm layout, but I just felt the urge to include it in this list. I’m a homesteader and I definitely love gardening. Gardening is one of the key elements in a successful homestead. 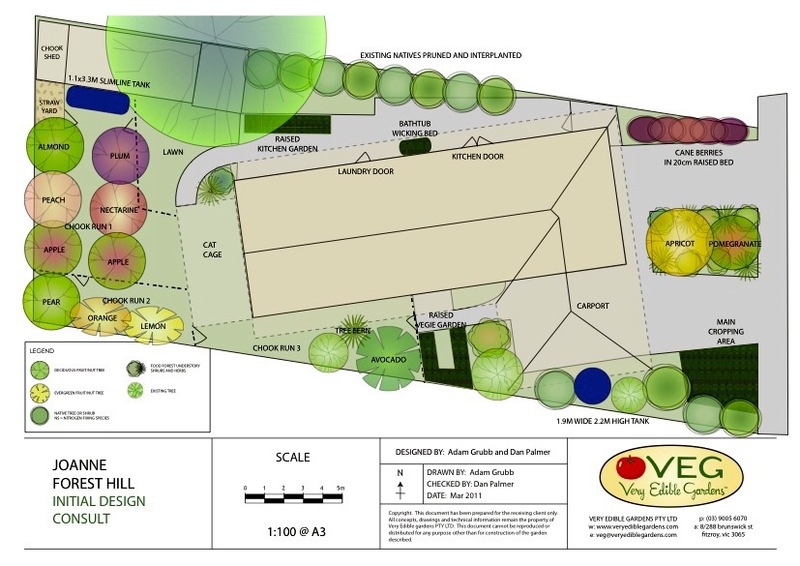 This food garden layout will help you in the arrangement of your plants to make achieve your homestead full potential. So, in my humble opinion, it worth checking it out too. These are all I’ve got for you now, my fellow homesteaders! Yes, homesteading requires lots of work but all of it is absolutely rewarding. I hope this list provided you that needed inspiration and the exact help you need in getting started with your homestead farm layout. Did you find this list helpful and interesting? Let us know in the comments below. Want to learn how you can grow your food in your own backyard? Check out helpful tips on how to grow all the food you need in your backyard and start growing your own food today!